Price and design are the two biggest factors driving the e-reader market; and in the past, Sony severely dragged its feet on the former. 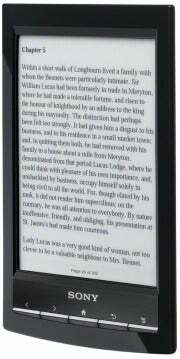 But today the company has rectified the situation with the introduction of the newest Sony Reader Wi-Fi PRS-T1. With a list price of $149, the reader costs 35 percent less than the Touch Edition model it replaces. In addition to the dramatic price drop, Sony has shaved weight off the design to make it, by a hair, the lightest e-reader on the market; and it has consolidated its lineup from three models to just one. Sony's Reader lineup was in dire need of a shakeup. The company's prices on the three models introduced around this time last year were grossly out-of-whack with the reality of reduced e-reader pricing over the past year, which occurred in response to Amazon's pricing of the Kindle. And the consolidation of the lineup from 5-inch, 6-inch, and 7-inch models to a single 6-inch model makes sense: The 5-inch display was less about anyone clamoring for a smaller screen than it was about hitting a price point, while the larger 7-inch display cost more and became an outlier because of that. The moves were also necessary. Early in the summer, both Barnes & Noble and Kobo Books released significant, lightweight e-reader refreshes that were priced to compete with Amazon's dominant third-generation Kindle, even as Amazon lowered its pricing via its Kindle With Special Offers on-unit advertising. Sony has partnered with J.K. Rowling for her upcoming Pottermore website, which will be the only place where you can get Harry Potter digital books. And in a move sure to drum up interest among Potter fans, Sony also will offer a special model of the PRS-T1, the PRS-T1HBC, with a free download voucher for the first Harry Potter ebook title, Harry Potter and the Sorcerer's Stone. Sony hasn't indicated whether the T1HBC would carry premium pricing, nor has it said where that model will be sold. The new Reader Wi-Fi weighs 5.9 ounces--which makes it more than an ounce lighter than Kobo's eReader Wi-Fi (7.05 ounces), Barnes & Nobles' Nook (7.48 ounces), and Amazon's Kindle 3 Wi-Fi (8.4 ounces) and 3G (8.7 ounces). The Reader Wi-Fi's reduced weight is a noteworthy improvement, considering that even last year's Sony Reader Pocket Edition PRS-350 (which had a 5-inch E Ink screen) weighed 5.6 ounces. The case design is smooth, with piano-black plastic edges; a soft, rubberized finish along its curves and edges; an angled-in 0.5-inch bezel; and metal accents on the front that complement the display. The interface is cleaner-looking, too, with better-designed menus and icons and easier navigation than on previous models. Comparison chart: How does the Sony Reader match up against its peers? Like its most recent predecessors, the Sony Reader Wi-Fi has a touchscreen. Inputting data was easy with the onscreen keyboard, and the test unit I tried was very responsive. Not only does Reader Wi-Fi support swiping for turning a page, but it adds gestures like pinch-and-grab for zooming in and resizing (you also have eight font sizes and six font styles), a convenient addition for manipulating text on the screen. Other gestures include tap-and-hold on a word to look up a definition in one of the 12 on-board dictionaries (including two British and American dictionaries, and 10 translation dictionaries to go to and from French, German, Spanish, Dutch and Italian). You can also take notes or highlight text easily, using either your finger or the included stylus. 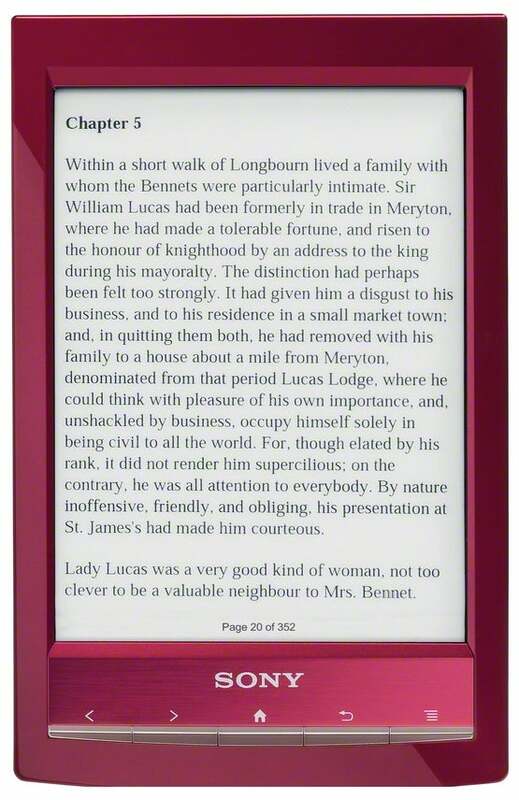 The Reader Wi-Fi supports EPUB, PDF, and TXT files. Text looked smooth and clear in the early test unit I saw, but Sony was still working on the page-turn technology, so I can't comment on that yet. The button layout remains intact from the 2010 Reader Pocket Edition/Reader Touch Edition generation, with physical page forward, page back, home, back, and menu buttons running in a row beneath the 6-inch E Ink Pearl display. Along the bottom you'll find a micro-USB port, a headphone jack, and the power connection; a microSD card slot is hidden beneath a sturdy, snap-in rubberized flap. The unit has 2GB of built-in storage, just as the Nook does. Sony says that the battery will last about 30 days, or three weeks with wireless on, between charges. That's the weakest battery life in the Reader Wi-Fi's competitive set among E Ink readers, which makes me wonder whether the company sacrificed some battery life to achieve the Reader's lighter weight. The Kobo eReader Wi-Fi, the next-lightest e-reader, has about a one-month battery life, while the Barnes & Noble Nook and the Amazon Kindle each deliver a battery life of up to two months. As part of his update on the state of Sony's Reader efforts, Phil Lubell, vice president of the Networked Technology and Services Division at Sony Electronics, noted that the company continues to invest in Reader hardware, and in its Reader store, which now carries more than 2.5 million titles, a "good number"” of which are free. The Reader store will also feature heavily in Sony's coming Android tablet efforts, with Reader coming preinstalled on the Sony S1 tablet. In addition, the Reader platform differentiates itself by supporting the public library system's e-book lending, with over 11,000 libraries on-board. The new Reader Wi-Fi is the first to support direct downloads from the public library to the device, and Reader continues to strengthen its position there.